My sister once said my husband and I were a frugal match made in heaven. To that -- I say thank you! We like nice things, but we're not extravagant people. We don't have the latest and great phone, worry about name brands [it's more about performance when it comes to gear] and we don't don't drive brand new cars. In fact a few years ago when we sold my 1998 Rav4 we purchased a low mileage 3 year old car. Why? Because it's the smart thing to do. We also have a 1993 F-150. Yes, we have two drivers and three cars. Technically, the truck is my brother's and is on loan until he has the space for it. #beachlivingproblems. Needless to say we're saving a fair amount in the car department, but to make sure you hit 200k + miles you have to maintain your car. Let's call a spade a spade -- No one ever said, "I love car payments." The moral is be good to your car and hopefully it will be good to you. Don’t overthink it, just do what you need to do when it comes to engine oil. Your owner’s manual spells out accepted viscosities and possibly even the recommended brand. Pro Tip: High Mileage? Use Pennzoil Platinum High Mileage it helps to reduce leaks and oil consumption in worn or higher mileage engines. It's a motor oil that is specifically designed for new or late model vehicles with over 75,000 miles, to help keep the engines running clean and going strong for a long time. With frequent rotation your tires will last longer. Resulting in less money over time. Pro tip: When you purchase new tires make sure they come with free tire rotations. 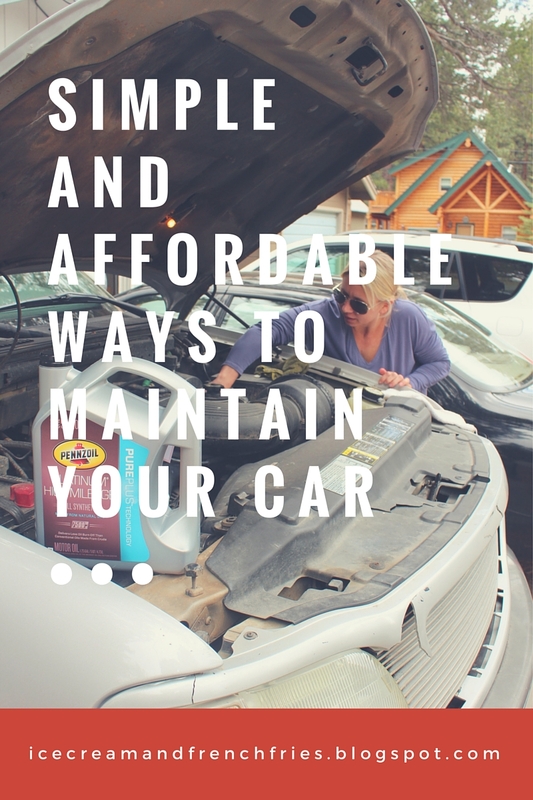 Following the engine and transmission maintenance recommendations in your owner’s manual will extend your car’s life and save you money in the long run. Don’t delude yourself into thinking that you can skip the cost of upkeep and still have a vehicle that runs efficiently for very long. When you try to buy time, there’s a good chance you’ll also buy more parts and labor in the future. To follow through on the previous tip to maintain your car, you can’t just turn the key and drive every time, and you can’t just roll into the shop every day for maintenance. You need to keep tabs on fluid levels and tire pressure. Checking lights and signals at the same time doesn’t hurt, either. Make it a regular habit and you’re less likely to get caught by surprise. Now for more savings... Calling all my online loving shoppers. While there are some stores that I could wander aimlessly in there are others I simply want to run in, grab a killer deal and run out. Walmart is one of those. Ordering online is easy and convenient, and it saves time in our busy days. You can either pick up the items, like oil, in store or have it shipped directly to your house! 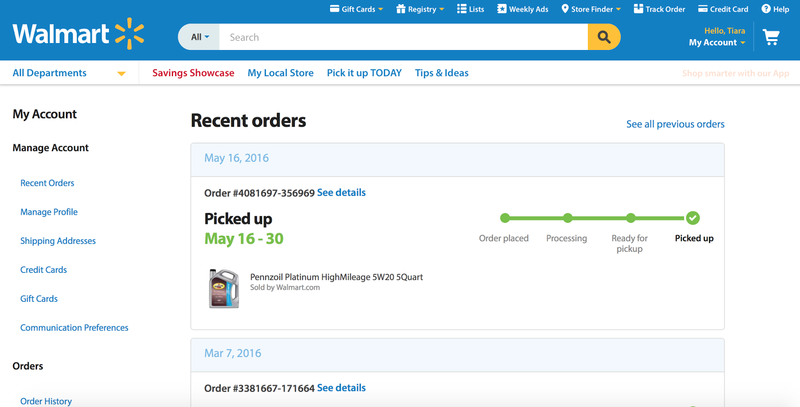 Recently we needed some oil for the truck so my husband placed an order through Walmart.com and I picked it up. Seriously it was that easy. 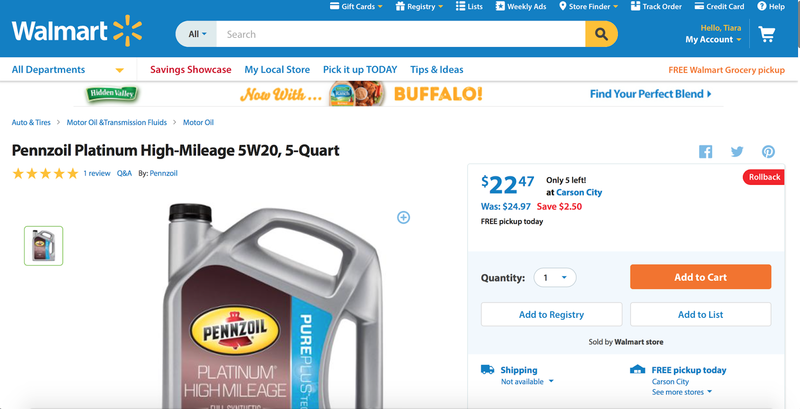 Deal Alert: A number of Pennzoil products are on Rollback right now for a limited time at Walmart.com. Honestly, this is my new favorite way to shop! Come on, who doesn't want to shop from their couch? I've shared a few of our dirty secrets. What are yours? Are you still driving the same car from high school? Do save money and change your own oil? What are you buying online? Thanks for the reminder - it's time for an oil change! My car is pretty old so I make sure to get it checked out every so often. My lease is up on my car and my husband and I are in the same boat. We are looking for a slightly used SUV for my next car to save money, etc. Cheers to saving money! Excellent tips! I always try to make sure to keep my car in good shape! I've never thought about shopping online for oil before though I do so hate having to wander through any Walmart. Sadly, I believe the online pickup area is even further back in the store than the auto section, so I don't know if it would save me any time. I wish I would have taken care of my care when I was younger. It is still holding on but I am not sure for how much longer.